Looking for an appointment? Click here to make one! Do you hate the shot? Does the thought of the dreaded dental needle make you squirm? Do you avoid the dentist because of the “novocaine” injection? Our solution – super topical anesthesia – can make the dental shot virtually painless! It looks boring but it packs a punch! 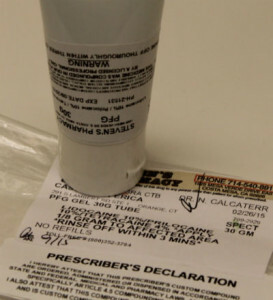 Super topical anesthesia is a powerful, pharmacy compounded blend of anesthetics. When applied with a cotton swab to the inside of the mouth, it numbs the area within 60 seconds. The area becomes so numb that when we do the actual injection, you will feel little to no pain! Of course we do all the other techniques to make the shot painless. This includes shaking and wiggling of the area, injecting very slowly, using the smallest needle possible, and many other methods. But the super topical makes all the difference every time we use it. We often times call it “topical on steroids” but remember there are no steroids in this – just powerful local anesthetics. Regular Topical Anesthesia. It reduces but doesn’t eliminate injection pain. 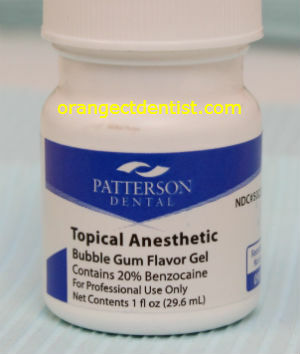 “Regular” topical anesthetic is 20% benzocaine. When applied to the gums, it will numb them slightly. But in most cases, you still feel some of the pinch. This topical anesthetic is easy to purchase, has a long time period before it expires, and does not come with the ordering and recording keeping requirements that compounded topicals do. As a result, most dentists use this. But believe it or not, there are still some dentists who don’t even use regular topical anesthetic! Super topical contains a proprietary combination of prilocaine, lidocaine, and tetracaine. This blend of powerful anesthetics can penetrate and go deeper than just the surface of the soft tissue of the mouth. In fact, this combination is so powerful it can only be administered under the dentist’s direct supervision. In addition, because of its strength, we have to abide by strict record keeping imposed on us the FDA. However, when our patients say “Doc, I didn’t even feel that shot” it is all worth it. Why don’t all dentists use powerful topical anesthetics? Many dentists are likely not aware of these products. In general, you have to be really passionate about dentistry to be aware of these powerful combinations. Some might be aware of them but choose not to use them due to rather onerous record-keeping requirements. We know that coming to the dentist is not fun so we try to make this as pain-free as possible. Contact us if you want to set up an appointment. Unless otherwise noted, all images and text are original works of Nicholas Calcaterra DDS. Unauthorized copying or reproduction is forbidden.